First Full Picture Of Chevy Volt? Remember when the first shots of the Chevy Volt dropped yesterday? It was like a pinup calendar of hunky GM engineers; you could barely see the car itself for their chiseled features and toothy grins. Well here’s the Volt de-hunkified, courtesy of Edmunds Inside Line. We’re still waiting for Edmunds to call us back, so we don’t know if GM slid them this shot under the table or if they spent hours photoshopping all the man-on-Volt action out. 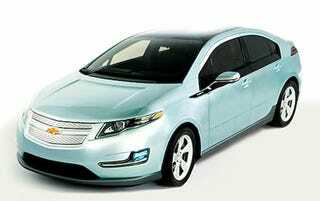 Either way, this is the Volt as it will be when it’s officially unveiled later this week.